Use one of these simple and creative DIY backsplash ideas to give your kitchen a serious face-lift without breaking the bank! Updating or adding a stylish backsplash to a kitchen one of my favorite ways to fancy up a home! Not only is your backsplash a large section of your kitchen, but it’s also something you look at quite a bit when working in there, so in my mind, it should be fun to look at! 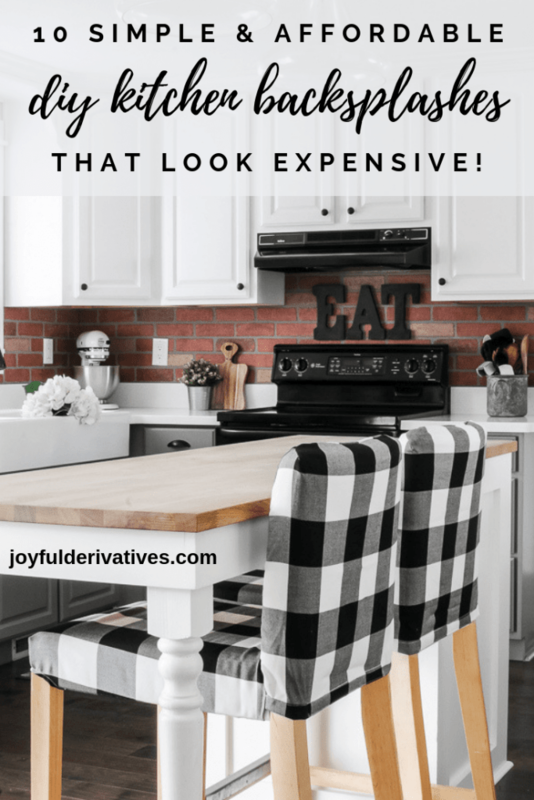 I realize that many of the fancy or stylish backsplashes seen in designer kitchens are super expensive, so in today’s post I wanted to share with you some SIMPLE and AFFORDABLE ways to update your kitchen backsplash on a budget! 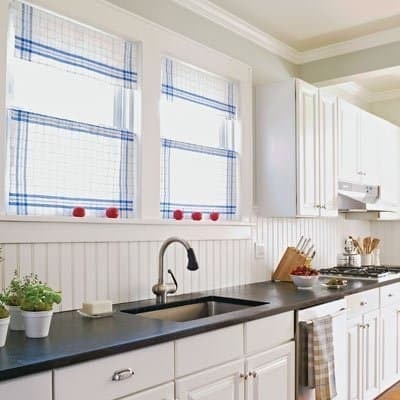 Each of these DIY backsplash ideas are something you can do in a weekend and require much less in the way of financial investment than their traditional counterparts. 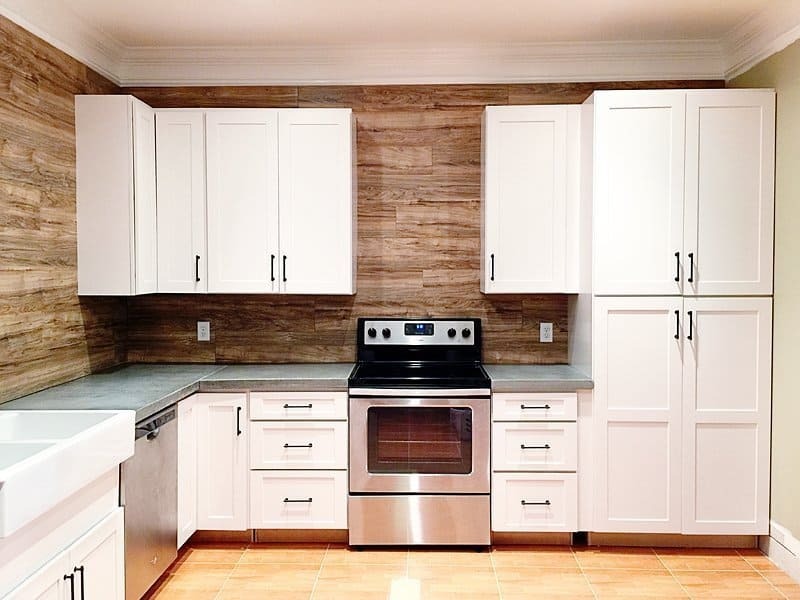 I hope these affordable DIY backsplash ideas help you discover an easy way to add some expensive looking style to your kitchen! Wallpaper has come a long ways in the last 10 years – not only with more styles available, but also with an ease of installation! Many wallpapers now come with a peel and stick backer so you don’t have to worry about the gluing process. Plus, it’s easy to remove when you want to change it out again! You can find all sorts of wallpaper online, but check your local hardware stores too because many times you can find clearance papers making the process even more affordable. Go big with this option – pick something with pazzazz like a bold floral print or a geometric concept and gain a lot of interest in your kitchen’s design! 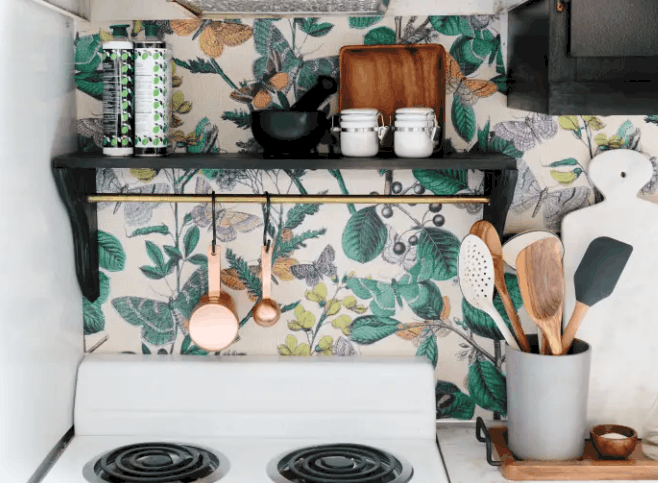 If you like the look of natural elements like stone or distressed wood for a kitchen backsplash, but don’t want to go to all the work and expense of installing the real stuff, you’ll be pleased to know that there are some great wallpaper options for getting this look too! There are many layered stone designs (this one’s even 3D!) as well as reclaimed wood and beach wood. I am AMAZED by the number of stylish peel & stick tiles that are available online. Honestly, just about whatever look you’re going for can be accomplished with this easy-to-install method! 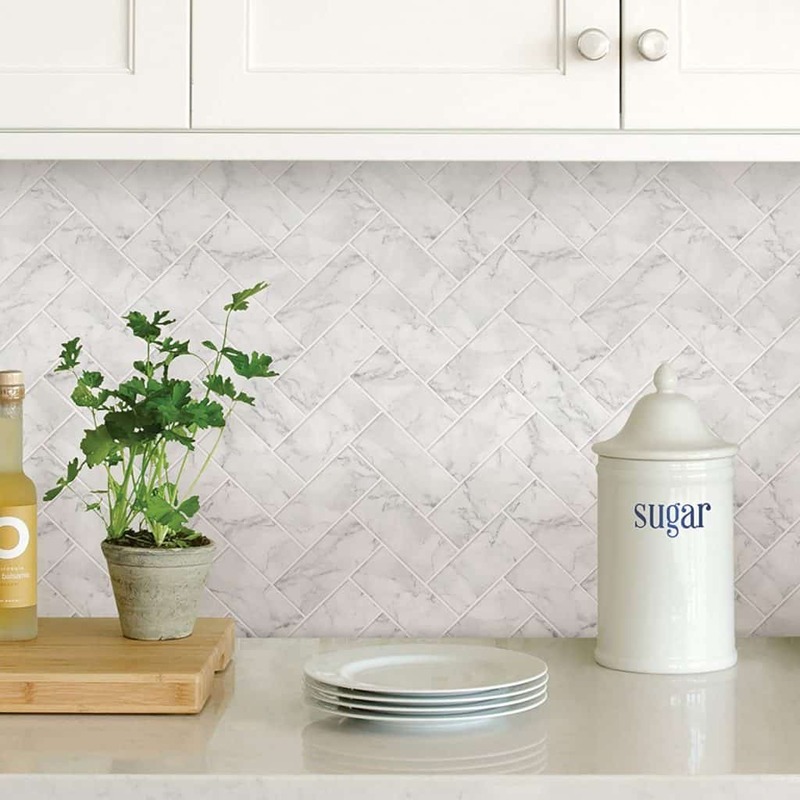 From subway tile to glass tile, to carrara marble to ornate tile – it’s all available. Of course, keep in mind that while these will look authentic from far away, but many of the reviews mention that up close they’re obviously a sticker. So if you’re looking for more of a permanent option – you might opt to try one of the next few DIY backsplash ideas that use paneling! 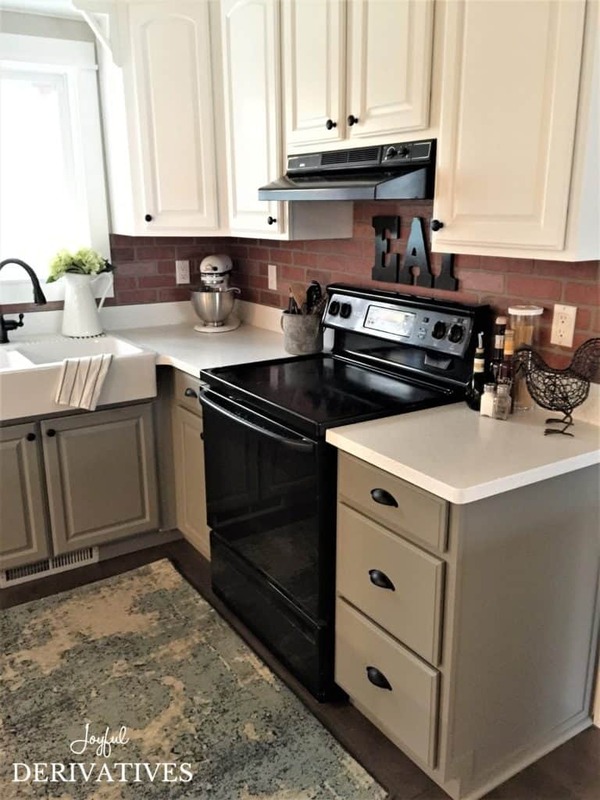 In our kitchen, we wanted to use our backsplash as a way of adding a bit of color to the space, so we chose to install a cheap and easy faux brick paneling. We did the entire kitchen in an afternoon, and for under $40! You can see the entire tutorial here. The great thing about this paneling is, not only does it look really authentic (we get asked ALL THE TIME if it’s real brick) but it can be installed right over the top of your existing backsplash. Also, it can easily be painted or white-washed to achieve a different look! If you’re wanting a low-cost option for getting a farmhouse look, this is the way to go! A great option for getting a country or cottage-style look is with simple beadboard paneling! We installed this type of backsplash in our previous home and loved it. It adds just the right amount of casual interest without making the backsplash feel like too much of a focal point. 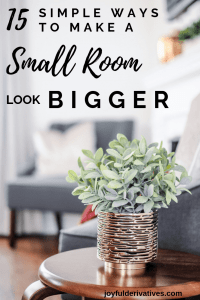 I was BLOWN AWAY by this creative DIY from Nicki at Sweet Parish Home! 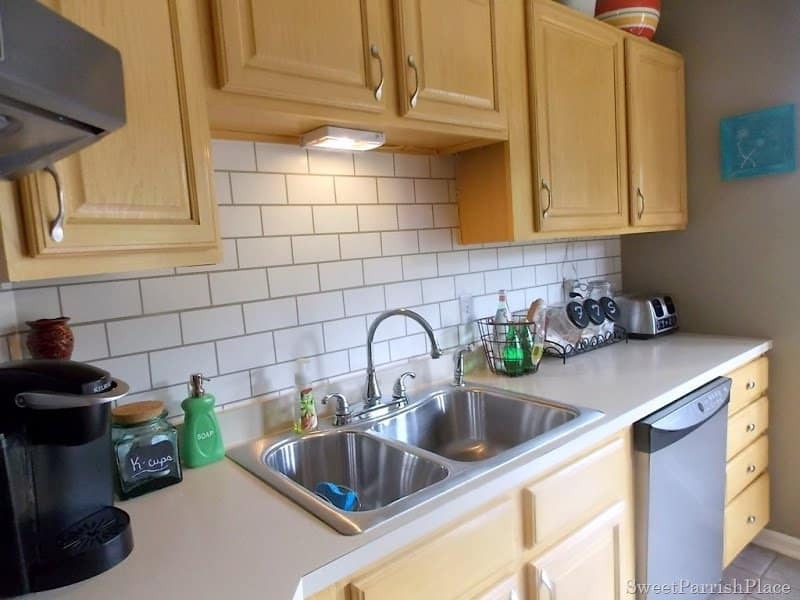 She literally just painted subway tile pattern onto the sheetrock walls between her countertops and upper cabinets to make it appear like she had subway tile. Brilliant, right?! 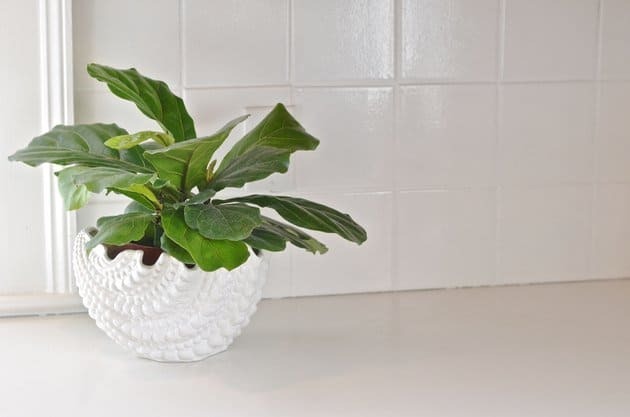 If you’re looking for the classic style of subway tile without all the cost, then you’ve got to go check out her tutorial! One of the simplest ways to update an outdated tile backsplash that no longer fits your style is to paint it! We painted the tile in our bathroom with this epoxy, and it worked super well. Stands up to the wear and tear of our kids and is still in perfect condition after well over a year! Another easy (and very trendy) way to update your existing tile with paint is to paint over it with chalk paint using a stencil. This method mimics the ceramic tile that is so popular right now and adds some serious character to your kitchen! 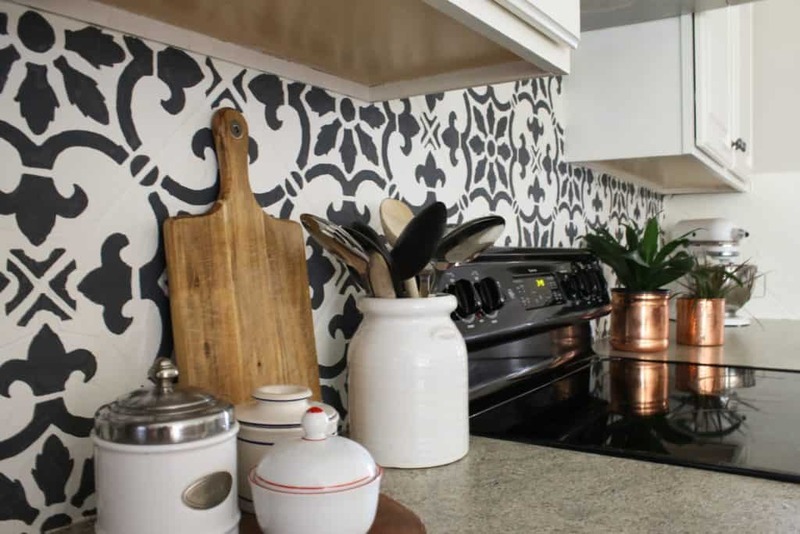 There are quite a few stencil companies that make stencils specifically for painting tile, and you can get them in a size made to match your existing kitchen backsplash tile. A few of my favorites are Cutting Edge Stencils and Stencil Revolution. The neat thing about this DIY backsplash idea is that you can completely customize the style of your new backsplash! You get to pick the stencil design, as well as the colors you paint. I’d recommend doing two high-contrast paints (so one light and one dark) in order to maximize the style. Oh, and don’t forget to seal your tile with some sort of poly-acrylic or polyurethane! If you’re wanting the look of wood on your backsplash, try installing laminate or luxury vinyl flooring on the wall! You get the durability and waterproof qualities of the flooring, as well as look of hardwood or faux tile. 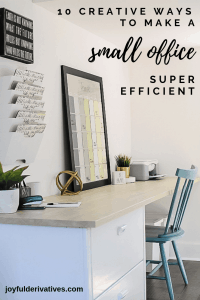 This method is ideal for situations where your planning to do an entire wall of materials or where your backsplash transitions into a large wall. Just keep in mind, if you do this, you won’t be able to install the flooring using its traditional “floating” click-and-lock method. You’ll have to either glue it using liquid nails or nail it on the tongue using a stapler or small nail gun. « Shiplap Wall Ideas for the Farmhouse Look!